When I was looking at an apartment in Atlanta, I noticed that there was an alcove in the living room that looked like it might have been a closet at one time. I started thinking about what I could do with that space, and as I sat here staring at my messy desk this morning I thought how nice it would be if I could use that as a sewing table and have a tiny office somewhere else. Cue the light bulb!! 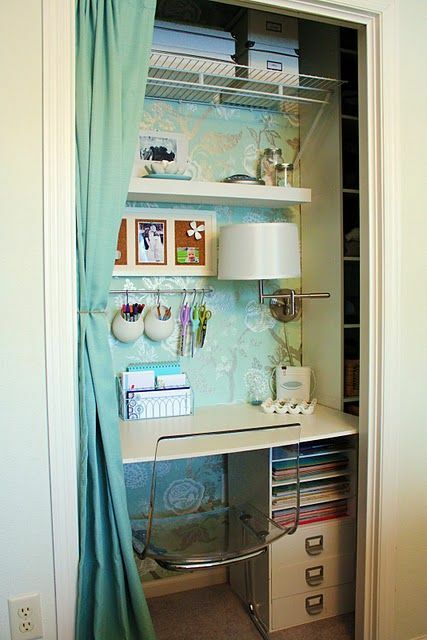 Why couldn't I use that alcove for a desk and storage place for some of my Etsy things. This is probably the size of the space in the apartment I looked at, and as I really don't use my computer at the desk, I would have room for my printer and office and shipping supplies. This is a cute "cloffice". I love that word. Not sure who originally coined it, but I am definitely going to keep using it. I like that she has added a curtain to hide the closet (I would definitely do that) and pretty wallpaper which lightens up the space. This is a cozy little space. Great use of white with just a pop of color. I bet this person is very organized. Love color? This would be the space for you. Painting the back wall with chalkboard paint is a good idea, but I'm afraid if I closed the curtain, my To Do list might get lost in time. Well, I didn't find my perfect "cloffice", but I am getting a lot of great ideas. P.S. 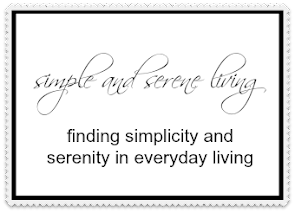 For small space decor ideas check out my new board here. P.P.S. You can find more of my small space living series here. They definitely gave me some inspiration, Michelle. Love those spaces! I think that's such clever way to set up an office. It really would get everything out of the way. Don't you just love that word? Hope you have a wonderful weekend too, Pam. That's a pretty good idea Laura. 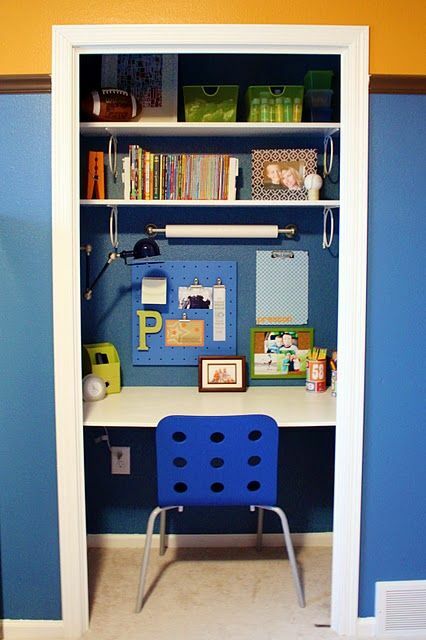 Great use of a small space! Great ideas! 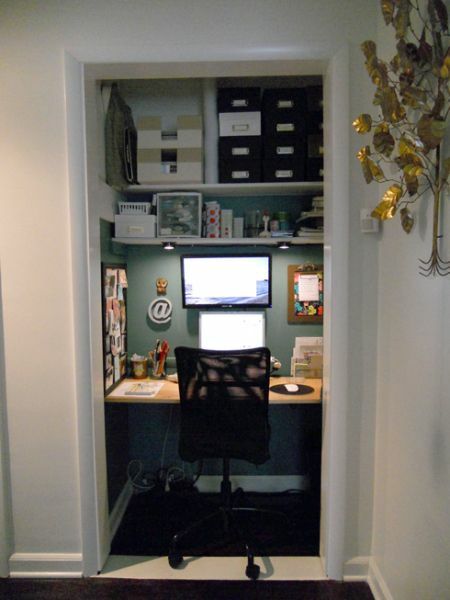 I spend too much time behind my desk to make it in a closet, but really, the pictures are full of organisation ideas!